Our campus is located on a peninsula known as 'Cape Eleuthera,' separated by six miles of mangrove creeks and bush from our neighbors in Deep Creek (or 'Freetown' as it is named on Google Maps). Situated adjacent to an abandoned 100-acre+ golf course on a man-made, miniature peninsula of our own, the school community is intimately intertwined with that of the Cape Eleuthera Institute. The marine science and sustainability research institute hosts PhD scientists and graduate students across a short bridge over a mangrove swamp between our campuses. Our programs employ professionals from around the world and from settlements close-by on Eleuthera. A small child-care center on campus, the Early Learning Center, teaches little-ones between 2 and 7 years old. Our Center for Sustainable Development leads the charge in innovating towards more sustainable systems on campus, creating a model for other communities in this island nation. While studying at The Island School, students have the opportunity to engage with seventh- through ninth-graders at the affiliated Deep Creek Middle School in a jointly-run Physical Education class. 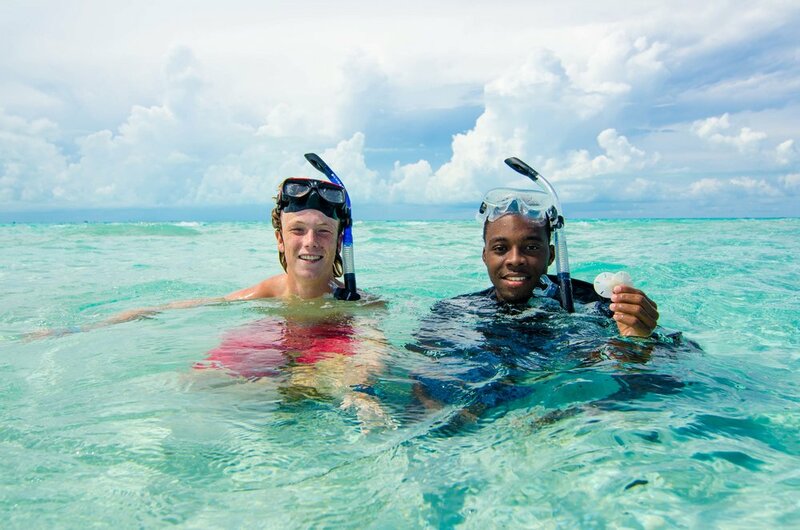 Island School students will receive 30 hours of community service credit for this class as well as for beach clean-ups, spreading awareness of environmental issues affecting Eleuthera and various other service opportunities throughout their semester with us.